This post has been lying in my drafts early this year. I ended changing the original title because it was based from the first Korean drama, Legendary Women. It took another K drama before I was able to complete this post. For those who are familiar with my K. drama obsession, you can easily sense the reason that prompted this post. 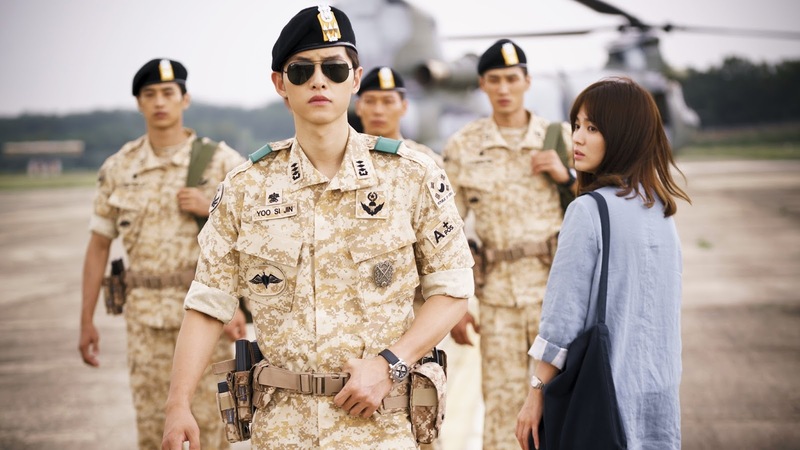 Blame everything on the conclusion of Descendants of the Sun (DOTS). I will surely miss the few weeks when I have to catch the delayed telecast in KBS World, only to later discover sites providing livestream from the original Korean channel. I have a feeling I will end writing a post why I love Song Joong Ki. But I have to control my emotions to remain coherent with my working title. So before Song Joong Ki dominates again hahahahaha, let me share my random observations about Korean culture and lifestyle, based from all the K. dramas I've watched. 1. Most characters in K dramas love to eavesdrop conversations - Problems is, most of them only listen to the initial part of conversations. The ending, someone will misinterpret everything. While this may feel a little irritating, we knew that such kind of acts actually thicken the plot. 2. Jealousy is the root of all evil in the world of K. drama - Most of the stories are propelled by jealousy in different forms. 3. K. dramas don't have excessive and rampant brand exposures / commercials in the during the TV airing - Most of my Filipino friends are probably familiar of movies and teleseryes, where the brand endorsement of the lead character, is forced to enter the plot. The lead character will get soaked in the rain, reach home tired and hungry, the wife prepares a delicious soup with the chicken broth cube being mentioned in the conversation. A few scenes after, the lead character will suffer from colds and there will be a medicine endorsement in the course of the plot. :D While I have nothing against these Filipino practices, this rarely happens in K. dramas. I've never encountered any K drama that forced one of the actors to mention brand endorsements. The most I have observed is a cameo appearance of the labels or brands being endorsed by the lead character. 4. The villains are often best dressed. The lead character is left with a casual and rugged outfit. This is especially true when the lead roles are given to female rivals. While my sympathy goes to the protagonist, I can't help but admire how the production team was able to organize the best ensemble for antagonist. 6. Korean brands are empowered in their local drama series - I only encounter a few foreign brands acting as sponsors in the K dramas I've watched. More often, Samsung remains as the official mobile phone of all the characters. This was the main reason why I stick with Samsung for my mobile phone. Hahahahaha Only to later discover that most Korean actors own and use an iPhone. I was able to prove this from the Korean actors maintaining an Instagram account. I maybe wrong, but I have a feeling that Korean dramas are encouraged to showcase Korean brands. This explains the constant appearance of Samsung and Hyundai in most drama series. 7. Female characters have hair color ranging from different shades of brown - It seems to me that a typical Korean actress should have her hair dyed to shades of brown. I only encounter female Koreans in black hair whenever the drama series carries a historical theme. 8. If females are obsessed with hair color, male actors should have the best hair style - I'm about to believe that South Korea offers the best hair styling for men. I love it when the lead actor suddenly becomes handsome just because of improvement in hair styling. 12. All K. dramas have OST - One thing I appreciate about K dramas is the effort to organize a complete ensemble of OST. Some were even original compositions. This is probably the main reason why K.Pop and the country's music industry is successfully thriving. 13. Family is love - This is a common point of interest among Asian drama series. I always notice that somewhere along the plot of the series, a loving mother, father or sibling will come in the way to help the lead character come back to his senses. 14. They love symbolical representations in different material things - In any K drama, there will be a necklace or any object that represents something. Problem is, just like in DOTS, the representation is often a Korean merchandise... the ending, the company producing the merchandise will experience an upsurge in sales especially when the K drama becomes a hit. In the case of DOTS, this J Estina necklace has become so popular even in countries where the drama is also aired. Yeah no 11 is so true! And the for the female rival always on best dress! Really nice observations! At KDrama fanatic ka nga! Galing! Let me add to your observations. Disclaimer though that most of these came from K-dramas I watched in the early 2000s, which was at the height of my Hallyu fever. The last K-drama I saw was in 2010, so K-dramas must have evolved since then. 1. The lead girl is crazy, scatterbrained, while the lead guy is proper, straight-laced, as in Lovers in Paris, My Girl, Princess Hours, Sweet 18, Surgeon Bong Dal Hee, even My Name is Kim Sam Soon even if Sam Soon was the older woman. 3. Wala silang concept ng love team. Although may reunion soap ata sina Kwon Sang Woo and Chou Ji Woo after Stairway to Heaven, pero hindi ko na yon napanood.